Psst. I have to whisper because I don’t want the universe to hear me and then jinx it, but the Pittsburgh Penguins have won 11 games in a row. Eleven games. They’re in first place in the Atlantic Division with the longest current win streak in the NHL, the largest goal differential in the NHL, and the most points in the NHL. Sidney Crosby leads the league in both points and goals, 10 points and five goals ahead of the nearest competitor, and 14 goals and 15 points ahead of The Kraken. WHISPER !?!? !…..HELL, SCREAM IT FROM Mt. Washington !!!! …The Penguins are playing freakin’ amazing hockey right now, the defensive lines have “clicked”, the buzz line is truly fun to watch as they swarm the opponents top O-lines, MAF is playing some of his best hockey and Sidney, well he’s just proving what we’ve known for a long time, he is the BEST in the NHL (tons of respect for that man)..and all this without Jordan Staal and pretty much Geno Malkin…. (and that Mr. Hillary Duff guy too). Imagine when 11 and 71 get totally healthy and back into the line up…WOOT !!! Capitals…here we come, Jan. 1st (after we kick their asses on 12/23) ! ps – thanks for the hockey post Ginny ! and furthermore…we are first place in the Eastern Conference(better than just the Atlantic Div.) and currently at 42 points – ahead of all teams in the entire NHL….again, SCREAM IT FROM Mt. Washington ! I will not lick my computer screen… I will not lick my computer screen… I will not lick my… dammit. Um, er, yeah. Sid has been playing lights out lately. Glad to see that his linemates (and the rest of the team) are taking the cue and stepping up their games as well. Season is long though and all this means nothing unless it happens in April, May, and June. A picture of the Kracken in a t-shirt would have merited the slogan “Please take this outside.” Maybe a trash can to underscore the message. Just sayin’. And, as we’ve been reminded before, it’s a long season, folks. Don’t get too high (enjoy, but in perspective) when things are phenomenal and don’t jump off a bridge when they lose three in a row again. Let’s hope there’s still a win streak to talk about in June. I saw this photo on a billboard today and nearly wrecked the car. YUMMY. Did I ever tell you that I have my 6 year old son calling Ovechkin “The Kraken” and “The Devil”? Your influence reaches far and wide. My son also declared the enchilada he ate at Las Velas the day after Thanksgiving to be “the best enchilada I’ve ever had!” Now THAT’S a restaurant review. I’m remaining cautiously happy and working feverishly not to jinx anything. And I’m working that Game Jersey Mojo like a Voodoo Witch Doctor. Add this to the Penguins success: Monday, the Kraken’s team blew a 4-1 lead and lost in a shootout. Wednesday night, the Flyers blew a 4-1 lead and lost in a shootout. Does life get any better than that? @G-Man: only if the Pens are the team taking the extra point each time. 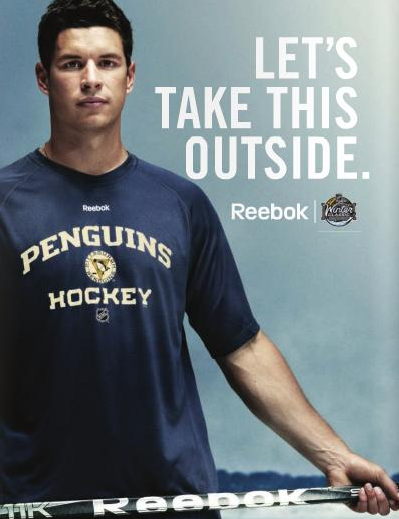 And c’mon, like we didn’t already know Sidney Crosby is freaking ridiculous. He just HAS to go and prove it to us. Gosh. Please, from now on, when they come out of the gate 5-5, STFU. It’s November, people. Get a grip. The Pens are riding a nice wave, and it’s especially heartening (to me, his biggest fan) to see MAF once more be AMAZING. I love Sid the Kid, of course, but that’s easy. Keeping faith with the rest of the team is just as vital. You know how much it killed me to give up my Winter Classic tickets because the baby could come any day. It was November when everybody was losing their shizz over the slow start, which is a Penguins tradition. Well, I guess losing your shizz over the slow start is a tradition too, but it COULD be retired. Hoochie mama! Bea Arthur for December! The WC store in the strip has that poster, but about 15 feet high, right at eye level. Yummy. Not only is he better than AO, but he is much better looking. With each win I keep telling myself, “it’s just one win – it’s a long season”, but gheesh it’s good to be a Pen’s fan right now. spoon,I will be sure to take a few extra hits off the vodka flask for ya while I’m freezing my donkey omelets in the stands…. For the love of God, DON’T TALK ABOUT IT!! Don’t you know how superstitious we hockey people are? There is nothing happening, avert your eyes, pay no attention to the men behind the jersey.